I know very little about these clocks. The back is missing, and the motor is a bit loud when the small animal carousel spins with the song, after the cuckoo bird. Estate find! This is a nice German made carved birds cuckoo clock. This clock features nice carvings with amazing detail. It features two tunes. When the music plays the dancers spin around. I set it up and everything is working fine. This is an old Black Forest wooden Hunters type cuckoo clock in good working condition. It is a 30 hour clock that cuckoos and bong the hour on the hour and once on the half hour. The bellows are good and all the parts are there. Listed is one my best cuckoo clocks from my collection. So this is a two owner clock. It looks like its cherry wood but I believe it is cherry wood finish. Everyhing works fine. Does show signs of average wear as you can see in the pictures. Trending at $125.97eBay determines this price through a machine learned model of the product's sale prices within the last 90 days. EXCELLENT WORKING CONDITION.SERVICED. CUCKOO;S ON THE HALF. HOUR AND EVERY HOUR AND COUNTS CORRECTLY. Has all chains and 3 pinecone weights and pendulum. Back panel is impressed 2-71 West Germany (February 1971). I DO NOT know how the clock works. It is complete and a bit dusty from age and storage ( it will need to be cleaned by new owner). Nice birds & leaves cuckoo clock made in Germany. The top piece & weights are not the original ones to clock but seem to go together well. Being sold As Is. For parts or repair. We will happily work with you. Here is a very nice cute small 1-Day cuckoo clock that I have owned for the past 8 years. This is a small clock as you can see in the pictures that I have attached. I am the second owner of this clock. It has the most adoreable cuckoo sound that you will love. Everything works fine and the clock keeps good time. I am guessing its from the 1970s. I have nothing but good things to say about this clock as it has always been reliable and has never given me any trouble. Always ticks and cuckoos and gongs. You will love it. I am selling off my huge collection of clocks and this is one of them. Any questions feel free to message me. Thank you for checking it out. There is a bird carving at the top, two cuckoo clock doors that open (cuckoos are a bird and German man), and bird and bird nest carvings on the bottom (the birds move up and down when the clock cuckoos). The wood carvings are made of solid walnut, rare carved pendulum with adjustable screw rod. Condition is New. It is not perfect. LARGE VINTAGE HAND CARVED MUSICAL DANCERS GERMAN CUCKOO CLOCK. This clock is beautifully hand carved! 19-1\2 inches tall. 14-1\2 inches wide. Movement is stamped G.M.1884288 1892176 A25-83 MADE IN WEST GERMANY. It is a one day/30 hour movement. Cuckoo's and plays music with spinning and turning dancers every half hour. Works great! Sounds great! Cuckoo's great! Comes complete with matching pendulum and 3 matching weights. Will be carefully packaged for shipment and sent USPS priority. Please email with questions before bidding. Thank you! B 728. CUCKOO CLOCK GERMAN, 2 WT, 30 HOURS WITH UNUSUAL WEIGHTS, CLOCK IS IN FINE RUNNING CONDITION, RECENTLY SERVICED, COMES WITH A FANCY CROWN THAT IS ATTACHED TO THE CASE. MOVT IS UNSIGNED. THE BOTTOM PORTION HAS BEEN REPAIRED. 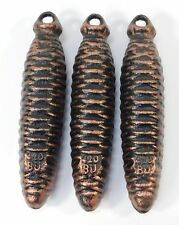 THE WEIGHTS ARE LEAD WITH ATTACHE SILVER FANCY TRIM ALL AROUND THE WEIGHTS WHICH MEASURE 3 3/8 INCHES LONG AND 1 1/4 IN DIAMETER. CLOCK IS 17 INCHES X 10 5/8 X 6 1/4 INCHES DEEP. Condition is Used. They are all complete with no missing parts. Most were kept in sealed boxes for years. Are you exciting in the process of designing the room of your dreams?. 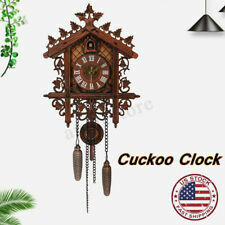 Kendal cuckoo clock is the right choice for you. Made of linden wood with hand-carved decorations. : Excellent Products. : Excellent Service. The clock is in excellent condition. There is one small defect in the left hand leaf on the clock crest (shown in the last photo). The original instructions are included. The cuckoo clock is complete. Band New, never used. Had good intentions of restoration work. 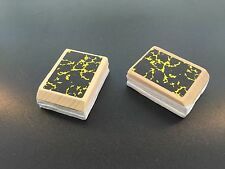 These are wood, nicely painted 2 1/4" tall. Vintage German Cuckoo Clock Musical. Condition is Used. Says on inside hubert herr. Triburg germany. Not sure how this thing works. It cockoos and plays music if you pull on the chains. It isn't tested. Based on all of the birds and styling, my guess is that it is a cuckoo clock. Things I Buy. All Wood Bellows have been Re-covered NOT replaced for an Excellent Cuckoo sound. 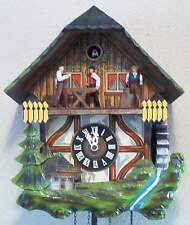 This is a Black Forest German cuckoo clock. I do not know if it works. B 729. CUCKOO CLOCK BY GERMAN CUCKOO CLOCK MFG COP, 30 HOUR WITH 2 WEIGHTS. CLOCK IN FINE RUNNING CONDITION, RECENTLY SERVICED, COMES WITH 2 WTS, PEND AND A FANCY TOP. MOVT. 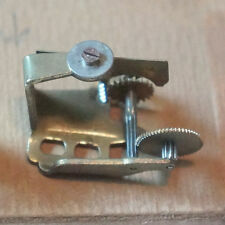 IS MARKED MADE IN GERMANY BY CUCKOO CLOCK MFG CO INC. DIV. PAT. U.G.M. ANGEM. THE CLOCK IS 16 INCHES TALL INCLUDING THE BIRD ON THE CROWN, 11 1/2 WIDE AND 6 1/4 DEEP. CLOCK COMES WITH CROWN, 2 WEIGHTS AND PENDULUM. You are bidding on a vintage clock in excellent working condition. please see photos for more details. item will require signiture upon delivery. The weights will ship seperate in a flat rate box to avoid damage to the clock. The wings and beak function. Wooden Cuckoo Clock Carved Bird . This auction is for 28 VINTAGE CUCKOO CLOCK WEIGHTS in normal preowned condition. Weights vary in weight as seen in photos. Please take a look at all photos, they show more than I can describe. Thank you for your interest in our auction!!! Case is a bit dusty still.Cuckoo works as he should- 1 cuckoo on every half hour appropriate number to match the hours. Dancers work as they should- tune plays every hour & the wheel that holds all the dancer pairs turns independently from the wheels that the pairs are mounted on, so as they turn as a whole, the pairs also turn.Pendulum & weights are included. This is a Hubert Herr marked, Black Forest German cuckoo clock. UP FOR BID IS A USED/VINTAGE CUCKOO CLOCK MARKED GERMANY ON THE FRONT AND BACK. MARKED MADE IN GERMANY ON THE INSIDE MOVEMENTS. PLEASE SEE PICTURES FOR BETTER DETAILS. PLEASE ALLOW FOR SOME WEAR. ALL QUESTIONS WELCOMED! NICE HEAVY HEADS. ABOUT SELLER: FROM THE MIDWEST WITH A 100% FEEDBACK SCORE. SHIPPING: $14.35 TO ALL USA CUSTOMERS. INTERNATIONAL CUSTOMERS PLEASE EMAIL ME FOR SHIPPING COST!! Made in Germany. 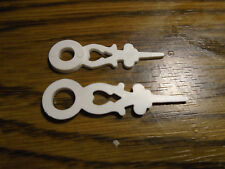 It will work with a maximum dial thickness of 3/16" (5mm). Requires 2 'AA' batteries (not included). We are more than willing to help you get what you need.